Bryan Cave Leighton Paisner (Russia) LLP, ранее в России – Goltsblat BLP, вновь вошла в списки одних из лучших юридических фирм на российском юридическом рынке по версии недавно опубликованного международного рейтинга The Legal 500. Фирма вошла в число ведущих (top-ranked) команд в 17 отраслях права, в том числе во всех основных областях специализации: недвижимость и строительство (1 группа восьмой год подряд), антимонопольное право (группа 1 шестой год подряд), интеллектуальная собственность (группа 1 четвертый год подряд), корпоративное право / M&A, разрешение споров, арбитраж и медиация, налоговое право, трудовое право, банковское и финансовое право, консультирование частных клиентов (Private Client) и др. В престижный список HallofFame (Зал славы TheLegal 500) вошел Андрей Гольцблат, управляющий партнер. В список Ведущих юристов России (Leading Individuals) в этом году вошли партнеры Виталий Можаровский, Евгений Тимофеев, Николай Вознесенский и Елена Трусова (в области разрешения споров). В число рекомендованных юристов по версии рейтинга также вошли партнеры Антон Ситников, Виталий Дианов, Екатерина Дедова, Олег Хохлов, Рустам Алиев, Матвей Каплоухий, Антон Панченков, Юрий Чернобривцев, Иван Веселов, Владимир Чикин и Роман Ходыкин (Лондон), руководитель практики трудового права Надежда Илюшина, руководитель практики уголовно-правовой защиты бизнеса Антон Гусев, руководитель направления налогового консультирования Анна Зеленская, руководитель направления Сергей Лихачев, советники Александр Ерасов, Игорь Животов, Юрий Иванов, Евгений Орешин, Юлия Романова, а также старший юрист Ирина Шурмина. В список «Next generation lawyers» были включены партнер Татьяна Паршак, а также советники Юрий Бабичев и Антон Нефедьев. Bryan Cave Leighton Paisner (Russia) LLP continue to have a strong presence in Moscow. The lawyers at Bryan Cave Leighton Paisner (Russia) LLP stand out due to ‘their impressive professionalism and deep passion for competition law’. The department is headed by Nikolay Voznesenskiy, who is ‘a true leader in competition matters’. Vitaly Dianov is recommended for providing ‘great defence services’ and for his ‘excellent understanding of the internal functioning of the FAS’. The team successfully represented Russian mobile operator VimpelCom in complex proceedings against the FAS concerning changes to B2B SMS service tariffs. Other clients include Sberbank of Russia and Mastercard Members’ Association. The IP team at Bryan Cave Leighton Paisner (Russia) LLP is praised for its ‘incredible professionalism, unique creativity in coming up with solutions to complex problems and its balanced business-oriented approach’. The firm is defending Double Data in precedent-setting proceedings alleging unauthorised data collection and violations of certain IP rights held by VKontakte, a Russian competitor to Facebook. Practice head Elena Trusova stands out for her ‘exceptional dedication and great power to convince and win any dispute’. Other key clients include the Association of International Pharmaceutical Manufacturers and OJSC Publishing House Prosveshcheniye. Evgeniy Oreshin has‘the strongest analytical and advocacy skills’, according to one client; Anton Nefedev is ‘outstandingly motivated’; and senior associate Irina Shurmina is ‘incredibly professional’. Standing out for its ‘unique combination of professionalism, hard work and client-oriented, practical approach’, Bryan Cave Leighton Paisner (Russia) LLP’s practice is headed by Vitaly Mozharowski, who has ‘vast experience and cutting-edge knowledge of real estate’. Also highly recommended are Rustam Aliev, ‘a fantastic lawyer and a strong, results-driven expert’, and Yuri Chernobrivtsev who ‘provides insightful advice and strategic directions’. Bryan Cave Leighton Paisner (Russia) LLP provides ‘top-notch transactional support’ and ‘prompt, effective and accurate legal advice’. The‘highly professional and result-orientated’ team has a strong offering in domestic M&A matters. In recent work, it advised Open Mobile and Rusintech LLC on the sale of a 75% stake in Open Mobile and the disposal of a 75% stake in Votron to Rostelecom, and handled Siberian Generating Company's acquisition of a 78% stake in Sibeco. Key practitioners in the ‘well-connected practice’ are department head Anton Sitnikov and partners Matvey Kaploukhiy, Anton Panchenkov and Ekaterina Dedova. Managing partner Andrey Goltsblat is the other key figure. Bryan Cave Leighton Paisner (Russia) LLP’s team of ‘highly qualified specialists’ provides ‘value for money’ and acts for a mix of financial institutions, energy and IT clients in domestic and major arbitral institutions. Roman Khodykin, who divides his time between the London and Moscow offices, is acting in a number of high-value international arbitration disputes, notably for energy sector clients. Elena Trusova is experienced in representing clients across a diverse range of industries in domestic and cross-border proceedings. Counsel Yury Babichevis active in commercial and investment arbitrations, where he regularly assists Andrey Goltsblat. Bryan Cave Leighton Paisner (Russia) LLP ‘demonstrates a strong understanding and remains up-to-date with local legal developments’. The practices handles IP litigation, real estate, commercial and tax-related disputes, among others. Key practitioner Ivan Veselov ‘is focused and quickly identifies the key solutions and obstacles for any given task’; he recently handled a number of disputes in the pharmaceutical, construction and transport space. The ‘indispensable’ ElenaTrusovaleads on IP-related disputes. Clients value Bryan Cave Leighton Paisner (Russia) LLP’s banking practice for its ‘accurate legal advice and commitment to invest its time and effort to build a long-term relationship’. The practice's wide-ranging expertise includes handling domestic and international financing matters, and it has recently won new instructions from multilateral development agencies; in one highlight it advised the International Investment Bank and the Far East and Baikal Region Development Fund on project financing a new passenger terminal and airport infrastructure in Khabarovsk. Demonstrating expertise in debt restructuring, Oleg Khokhlov assisted the EBRD with restructuring a $30m convertible facility to Prognoz Group by way of a debt-to-equity swap. Recently promoted partner Tatiana Parshak is ‘a brilliant lawyer and a safe pair of hands in complex transactions’. Bryan Cave Leighton Paisner (Russia) LLP’s strong expertise in real estate finance is evident in Tatiana Parshak acting for Raven Property Group on two secured facilities totalling €65m from VTB Germany for leveraging the acquisition of commercial real estate properties in St Petersburg. Oleg Khokhlov, who is another key figure, handled a number of corporate and financing structuring and ICO matters in the fintech sector. Igor Zhivotov regularly assists Khokhlov with various complex transactions. The group also has a strong track record handling restructuring. 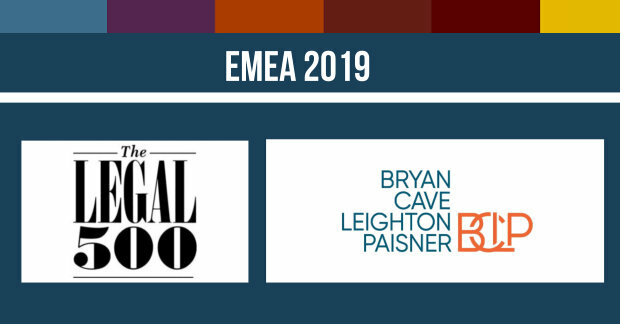 The employment practice at Bryan Cave Leighton Paisner (Russia) LLP is ‘capable of achieving incredible results quickly’ and ‘delivers a superb client management service’. Recommended for their ‘strong legal expertise and creative ideas', head of the department Nadezhda Ilyushina and counsel Yuri Ivanov successfully defended Teva Pharmaceutical Industries in proceedings regarding claims brought by former employees. Bryan Cave Leighton Paisner (Russia) LLP’s team handles complex restructuring mandates, often in multiple jurisdictions, as well as bankruptcy proceedings for domestic and international clients. In recent highlights, a cross-disciplinary team consisting of Oleg Khokhlov,Elena Trusova and Ivan Veselov are advising the European Bank for Reconstruction and Development on restructuring a $30m convertible facility to Prognoz Group through a debt-to-equity swap arrangement, in the process changing the EBRD’s role from a lender to a minority equity investor. Khokhlov acted for Sberbank Investment on a complex restructuring of all external financing provided to the Genser Group. Bryan Cave Leighton Paisner (Russia) LLP's full-service tax practice has a strong reputation as ‘one of the best tax advisory and tax litigation teams in Russia’, according to one client. The sizeable team, headed by the ‘outstanding’ Evgeny Timofeev, who ‘always suggests the most practical and efficient solutions’, attracts domestic and international clients, including Rusklimat, the HeadHunter Group and OBI, with its 'professionalism, sound technical knowledge of tax matters and outstanding experience'. Timofeev is assisting Da Vinci Capital with the preparations for acquisitions of several platforms relating to the setup of a new joint investment fund in Luxembourg valued at $20m.Vladimir Tchikine leads on customs and indirect tax matters, while associate director Sergey Likhachev focuses on tax disputes. With its 'in-depth understanding of the specifics of the TMT sector', the team at Bryan Cave Leighton Paisner (Russia) LLP advises on matters involving cryptocurrencies, innovative payment systems, technology transfer and development. Led by Ekaterina Dedova, the team advised key client Da Vinci Capital during the second round of the initial coin offering of the Telegram Group. Other notable clients include Double Data, Mobile TeleSystems and MasterCard Members’ Association. The transport department at Bryan Cave Leighton Paisner (Russia) LLP is headed by Vitaly Mozharowski. Highlights included providing legal support to the Sheremetyevo International Airport during its $1bn reconstruction, as well as advising the International Investment Bank on the acquisition of multiple passenger and special purpose aviation assets. Bryan Cave Leighton Paisner (Russia) LLP’s white-collar crime practice has expertise in tax and fraud matters and cybercrime. The team expanded its capabilities with the hire of Julia Romanova from Chadbourne & Parke. Anton Gusev is a key name to note; his recent work includes securing the dismissal of criminal charges against the employees of a subsidiary of one of the biggest Russian metallurgical companies and successfully suspending criminal investigations for a major construction materials manufacturer. Alexander Erasov is a name to note for tax-related disputes, criminal defence and investigations. Bryan Cave Leighton Paisner (Russia) LLP retains a strong client base in the energy, mining and oil and gas sectors, counting Sibur and Uralkali as clients. The practice is assisting with project finance, development and regulatory matters concerning the Russian section of the $20bn South TurkStream Offshore Pipeline project from Russia to Turkey. In other work, Matvey Kaploukhiy advised Siberian Generating Company on acquiring 78% of the shares in Sibeco, and Vitaly Mozharowski is assisting Akkuyu NPP with transactional matters regarding a greenfield nuclear power project in Akkuyu, Turkey. Anton Sitnikov focuses on M&A and joint venture deals. Bryan Cave Leighton Paisner (Russia) LLP has notable expertise in the infrastructure sector where it is involved in significant domestic projects including the $1bn reconstruction of Sheremetyevo International Airport. In other highlights, real estate and construction specialistVitaly Mozharowski is advising on the construction of landfall facilities and the laying of the Russian part of the gas pipeline as part of the Nord Stream 2 pipeline system project. Oleg Khokhlov is assisting the Far East Development Fund with project financing for the construction of a new passenger terminal and airport infrastructure in Khabarovsk. Bryan Cave Leighton Paisner (Russia) LLP advises beneficiaries and high-net-worth clients on corporate restructuring, immigration and family law matters. Evgeny Timofeev heads the team, which includes Anna Zelenskaya.